In generic terms, there are three main implementation strategies for KM, and only one of them is really reliable. You ultimately want the all the elements of the KM framework deployed across all of the business. You want to get to the yellow square in the figure to the right. There are three ways to get there. 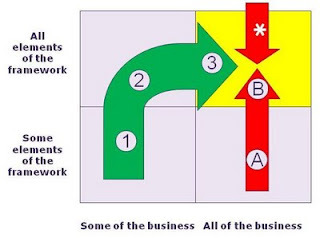 The red arrow with the Asterisk represents getting there in one go - in other words, rolling out the entire framework across all the business, straight from the word go. This is a risky strategy. You only get one shot at this, and if you get it wrong, it may be permanently wrong. The red A/B arrow represents rolling out elements of the framework one by one across the business. This is a common approach, and people often start by rolling out the technology element (step A), and only later introducing the other elements of roles and accountabilities, processes and governance. This also is a risky strategy. Few framework elements add much value when working in isolation, and you may devalue the whole KM implementation if you introduce something that adds no value. The green arrow represents a tailored implementation. At step 1, you test elements of the framework one by one, locally in the business, to make sure they work in the company context, and to tailor them until they do. At step 2, you pilot the whole KM framework in one part of the business, to make sure the complete framework adds value to the business, and you tailor it until it does. Finally (step 3) you roll out this tried, tested and piloted framework across the business as a whole. The green arrow takes longer, but it works.